After a visit to the doctor (played by Three Stooges regular Vernon Dent), Moe, Larry and Shemp travel to the American Old West for the sake of healing Shemp’s leg of an enlarged vein. Once there, the villainous Doc Barker mistakenly thinks that the map of Shemp’s vein is a map to a gold vein worth millions. This leads to a funny series of misunderstandings, as Doc Barker wants to get his hands on Shemp’s “vein”. With Shemp playing a crooked hand of poker, while Moe and Larry mix up drinks for the card players. In the process, they discover that Barker’s band of outlaws has locked up “The Arizona Kid”, and plan to force his girlfriend, Nell (played by Christine McIntire, working with Shemp for the first time) to marry the leader of the outlaws. Shemp turns the tables on the crooked gamblers by intercepting the cards that one of Barker’s men is passing under the table, ending up with the winning hand instead of Barker. When Moe and Larry deliver their “special” drinks, the plan actually works (in spite of Moe’s getting the drinks mixed up) with Barker calling for water. Shemp takes this as an opportunity to drown him with a fire hose, giving Moe and Larry an opportunity to take off Barker’s soaking wet coat and pass the keys to the Arizona Kid’s cell to Nell. Soon enough, the Arizona Kid is free, riding off to summon the cavalry. Doc Barker sees the Stooges with his coat, and swiftly tries to capture them. With Moe and Shemp escaping, and Larry being put in the Arizona Kid’s cell, waiting to be shot at sunset. Moe, Shemp and Nell try to break him out. Nell sings, trying to down out the sound of the boys’ tools. Until they knock a bar from the cell through the basement ceiling, and into Doc Barker’s chin! Soon the chase is on, with Barker’s gang chasing them through the box-laden basement, and all seems lost until Shemp grabs a stick of dynamite and threatens themânot realizing that he’s accidentally lit in via a hanging lamp. They chase the gang upstairs, play “hot potato” with the lit dynamite, throwing it away at the bar. Where Doc Barker and his gang were hiding. The Stooges manage to defeat the scalawags, only to have the U.S. Cavalry ride up afterwards, ending the short film with Nell and the Arizona Kid reunited. Out West was remade in 1954 as Pals and Gals. Out West is available as part of The Three Stooges Collection Volume 5. Shemp (Shemp Howard): I ain’t gonna lose my leg, am I Doc? I’ve had it ever since I was a little kid! Doc Barker: I could do things with a vein like that. Shemp (Shemp Howard): You mean operate? Doc Barker: That’s right, partner. Really go to work on it. No small-time stuff, either. Doc Barker: If it’s near the surface we’ll use twenty men with pick and shovel. Shemp (Shemp Howard): Listen, Doc! Doc Barker: If it’s any deeper, use dynamite. Shemp (Shemp Howard): Oh, no! Not on my vein! Doc Barker: Tin horns around here say Doc Barker ain’t a big operator. Well, they won’t have a leg left to stand on. Shemp (Shemp Howard): Neither will I.
Nell (Christine McIntyre): Johnny, these men are gonna help you! The Arizona Kid: Are they? Shemp (Shemp Howard): [to Moe] Are we? Moe (Moe Howard): [to Larry] Are we? Larry (Larry Fine): [to no one standing behind him] Are we? Moe (Moe Howard): By the by, Jasper, how long do you wear a shirt like that? 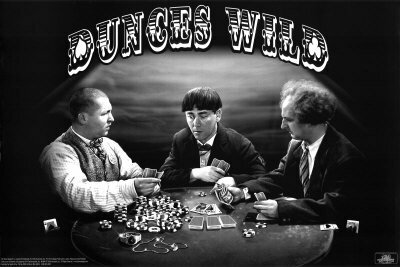 Moe (Moe Howard): What a brain, should be on the meat counter. Moe (Moe Howard): What do you know about making drinks? Larry (Larry Fine): [to Moe, as they’re mixing drinks] Hey! You put paint in there! Larry (Larry Fine): What’s that? Moe (Moe Howard): Paint remover. Moe (Moe Howard): Why don’t you look where I’m going? The Arizona Kid: Colonel, I hope you’re not too late! Colonel: Son, never in the history of motion pictures has the U.S. Cavalry ever been late. Moe (Moe Howard): The Stooges have landed and have the situation well in hand!